Our experience in a wide range of surveying services helps clients meet property boundary and various construction challenges. 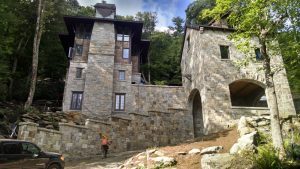 By ensuring that projects are completed on schedule has reinforced our reputation as a trusted provider throughout Western North Carolina. 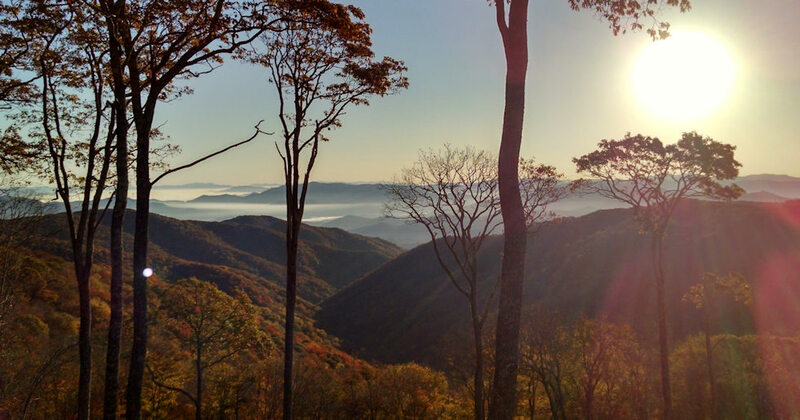 Since our founding in 1985, we’ve surveyed hundreds of miles of property lines and thousands of acres in Western North Carolina. Our land surveys have taken us along the same paths trod by the landowners and surveyors before us, a journey through the history and times of our area. Our team of experts is at the core of what we do. We are a small group of dedicated professionals and technicians whose goal is to provide prompt and accurate surveying services so that your experience with us would cause you to recommend us to others. 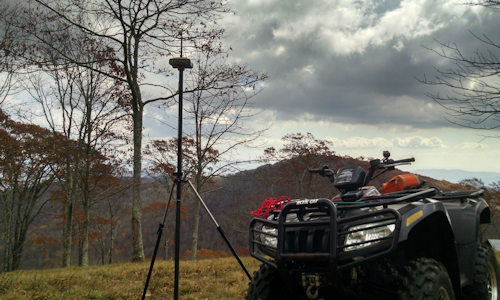 Ben West on the land surveying crew mapping a 5 mile portion of the 4000 acre N.C. Wildlife Commission Needmore Tract. The boundary here was along a contour line along the east bank of the Little Tennessee River as it flows north out of Franklin. 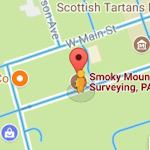 Smoky Mountain Land Surveying, PA (SMLS), located in Franklin, NC, offers a full range of mapping and land surveying services to private landowners, public agencies, design professionals and building contractors throughout Western North Carolina. Ben West, Owner and President, has over 30 years of experience as a Professional Land Surveyor in our service area. Ben has taken great pride in delivering a professional product to those his surveying office serves. He and his staff understand that since many of their clients are not using the services of a land surveyor on a regular basis and may not be familiar with the products they offer, they make it a priority to treat each client with the personal, patient and courteous attention they deserve. 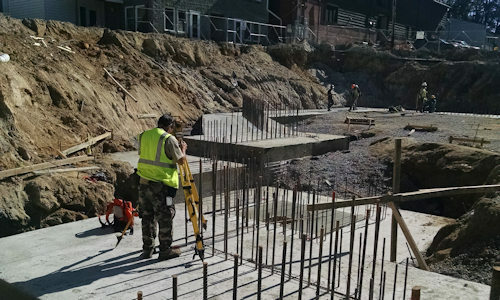 We are dedicated to providing their clients with the highest quality service while completing our surveying projects on time and within budget. 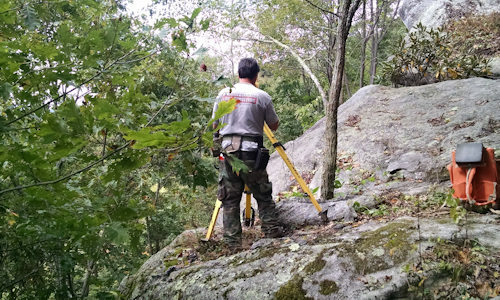 Smoky Mountain Land Surveying utilizes conventional survey equipment along with survey-grade Global Positioning System (GPS) technology to provide the client with an accurate and precise description of his or her property corners and boundaries. We use AutoCAD drafting and design software and the latest in computer technology to process, design and map each project. This digital information can be easily passed to or used by the client or any legal or design professional in their field of expertise. Our field crews work primarily in North Carolina’s seven westernmost counties of Macon, Jackson, Clay, Graham, Cherokee, Swain and Haywood. We have in our completed project files several thousand plats of perimeter, topographic and construction stakeout surveys ranging in size from 0.0001 acre to over 1000 acres. 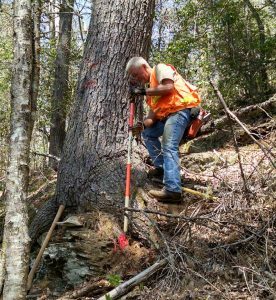 Initially, a large percentage of our work was in the form of property boundary and road right-of-way survey projects for the United States Forest Service. As time passed, our work load gradually shifted from those contracts to work performed in the private sector. Over the years, we have developed close working relationships with many of the attorneys, lending institutions, design professionals and building contractors in this area.